Regular readers know that we love our our outdoor family adventures. We try and get out as much as we can during the week and definitely every weekend. Over Christmas, however we always have less time for this so during in the New Year we look forward to getting adventurous again. This year, things have been different and of course Mum has been our priority so we’ve haven’t had any fresh air apart from the school run all year (all two weeks of it!) so at the weekend we decided to amend that and went to one of our favourite beaches, Newport Sands. On Sunday morning the kids were all settled at home. Caitlyn and Izzy were happy playing together, Rebecca was “writing her book” and Danny was playing on his console. When I suggested going to a beach, they took one look out of the window and decided they were happy to stay home! I could understand this but also realised the longer they went without “getting outdoors” the harder it would be to get them active again, so with the promise of Danny being able to fly his new Drone, off we went, the hills were alive with music as we drove over the Preseli’s listening to our favourite tunes (which happened to be Guns N’ Roses instead of the von Trapps on this occasion). We got to the beach. The Sat Nav postcode is SA42 0NR and there was ample free parking (charges apply during the busy summer months). There is also a Surf and Lifesaving Club. The toilets were open (yay!) but the shop is only open during the summer months so bring your own snacks (and a flask during winter!). I was so happy to be there. Knowing mum was on the mend and being visited by my sisters, I felt I had no worries or cares for the first time in ages as I took a deep breath of the fresh air and took in the stunning view. After their initial hesitation, the kids finally began exploring the real world again. They enjoyed the space to run around. We beach combed, finding pebbles, shells, seaweed and cuttlefish bones (reminding me of a childhood memory of my Nanny and Grampy’s old pet budgie, Twinkle as he loved to nibble these). They played with the breakers. In the past they’ve used them as football goals, an obstacle course, a net and also limbo-ed under them (with a bit of driftwood going across). On this day they climbed onto them and tried to jump along (Izzy had help from her big brother!). We walked along the sand dunes. We ran down to the sea, but not for a swim just yet although I know many of our friends enjoyed a swim in the sea on New Year’s Day while we were up the hospital. We didn’t fly a kite but we did fly a net! You can tell how windy it was from the kids hair. I have to remember to pack a kite in the boot again! Stick fun! Danny broke a stick in two so Izzy could have one too. That’s brotherly love as he wouldn’t share a stick with anyone! A sand storm was brewing here, I only managed to catch it on video but the kids enjoyed watching the “magic sand” swirl across the beach, like smoke from a genie’s lamp. 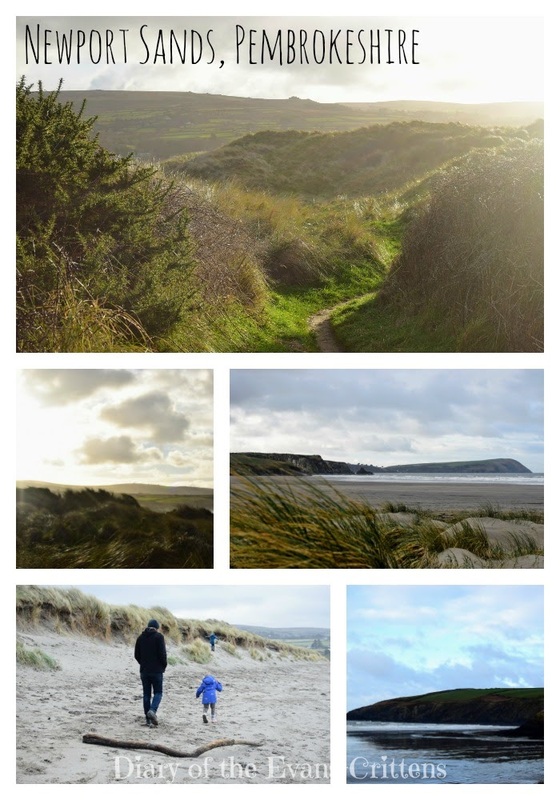 At the end of Newport Sands, turning behind the sand dunes takes you along River Nyfer (or the Nevern River). We walk alongside this and then along the path back to the car park so it makes an enjoyable circular walk. We took this photo to show Nanny up the hospital as the kids were missing her lots! We saw ducks and swans in the river. From here you can walk across to Newport Parrog and to the old burial chamber, Carreg Coetan Arthur. The kids initial reluctance had soon changed to smiles and enthusiasm so I’m so glad we “forced” them to come to the beach. We played with driftwood and made shelters. Rebecca has the look of Patsy from Ab Fab here with her windswept hair! All of the kids had fun as did us parents! Walking back, we passed the corrugated tin shelter. I enjoyed the stunning views from the coastal path. This made the perfect ending to a lovely day and meant tea had all been sorted so I could concentrate on visiting mum at hospital during the evening. I’m looking forward to more outdoor adventures and free days out in 2017! What have you been up to so far? Newport Sands– a video from 2015- the kids look so little!